Radio is the latest addition to Spotify's iOS apps, which allows users to take the streaming music service's Pandora-like functionality on the go. But this isn't just for the people with premium accounts. Anyone can listen to Spotify radio on their iOS device for free. Nearly every subscription music service offers some sort of free access on the desktop, but due to licensing agreements have had to restrict mobile access to premium users only. 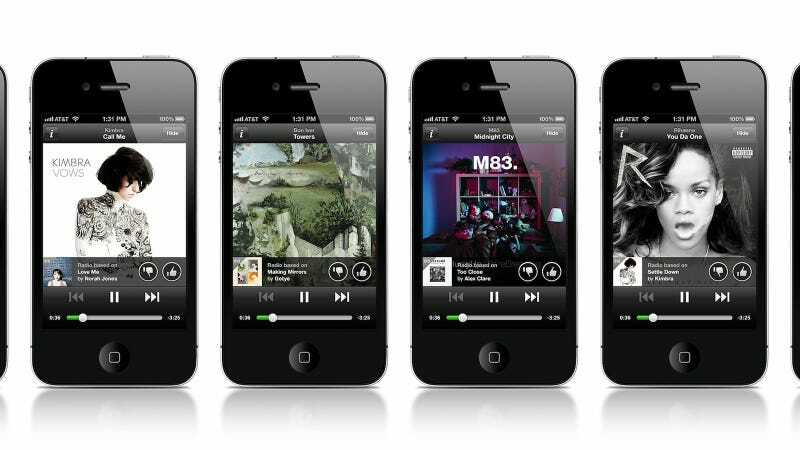 Spotify opening up mobile access to radio for everyone changes all that. Users' radio stations will be able to draw from Spotify's entire 16 million song catalog, though just like other services, free users will only be able to skip a select number of songs per hour, and will have to listen to ads (premium users, of course, don't have to deal with any of this). More than just an isolated afterthought tacked onto the mobile app, Spotify radio is visible throughout the entire app. Users will see visual prompts to create radio stations from songs, artists, albums, playlists, etc, which can then be saved for repeat listening. A big part of this new mobile feature is the addition of a thumbs up/thumbs down system, which allows a station to be improved and fine-tuned to user preference. Any song played on a radio station can quickly be added to any playlist, and songs that are given a thumbs up are automatically added to a list of recently liked songs. All in all, it sounds like a pretty useful discovery tool for the aveage user.